I wish I had a better picture of the baby dress I made for our new niece. As of late I am getting bad at remembering to take pictures of the knitted gifts I give away. So I made another Emma Tunic in the teeny size for our niece. We visited them just last week and I didn't even take a picture then! Oh well. So what I have is the one I took right before splitting the dress to make the yoke. This is a favorite pattern to knit because it's easy and so sweet. I like that it can be layered over a onesie or worn as is. I hope little R enjoys it as much as I did making it for her. Usually I knit this in a wool. For this dress I decided to use a lighter yarn that would not be too hot to wear in a warmer climate. Hill Country of Texas can get hot so this needed to be made of a yarn that can be year round functional. The Knit One Crochet Too Nautika is a microfiber nylon blend. It's a great yarn to use and holds up well. 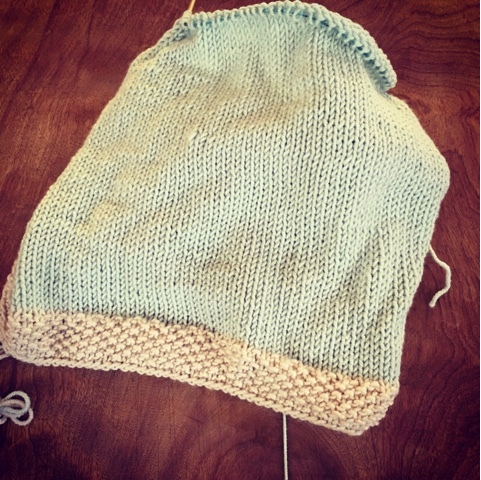 A little more drape to this than wool the yarn is a great choice for baby garments which need more ease. The soft texture makes it great for babies as it should not be as bothersome as some wools can be on delicate skin. And it's washable! A great help to any parent.